Peoria, Illinois, my hometown, is where you will find today’s “Museum of the Day”. 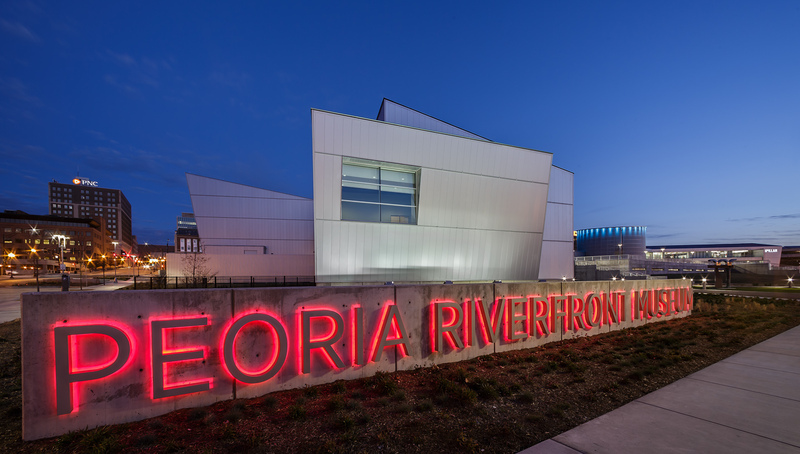 The Peoria Riverfront Museum is a one-of-a-kind collaboration where visitors can explore and learn about the world—from our own backyards to far-off galaxies. We focus on interdisciplinary learning—a fusion of art, history, science, and achievement designed to develop knowledge, critical thinking skills, and a lifelong passion for learning. We’re the only museum in downstate Illinois to be affiliated with the Smithsonian Institution. We also strive to bring to the region exciting national and international exhibitions. Our goal is to offer exhibits that visitors might normally have to travel great distances to experience. Our programs are an extension of the classroom—engaging the community, empowering teachers, and exciting and educating students. The Museum is a collaborative effort of eight organizations with nearly 500 years of combined experience educating, entertaining and supporting culture in the Peoria area. For more than 10 years, these entities worked tirelessly to bring to life a one-of-a-kind experience for the people of central Illinois and beyond. Our collective objective is to provide interdisciplinary learning opportunities for people of all ages, create a diverse and cultural campus in the heartland, and positively impact our region’s economy. A far cry from the Lakeview Museum & Planetarium that I grew up with, I am looking forward to a trip to see my family and explore the great new building that is now on the riverfront of the Illinois River. The Children’s Museum of Indianapolis is one of the country’s oldest children’s museums and was one of the first of a handful of museums accredited by the American Alliance of Museums. Founded in 1925, The Children’s Museum of Indianapolis is a nonprofit institution committed to creating extraordinary family learning experiences that have the power to transform the lives of children and families. 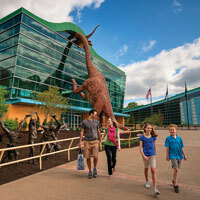 With a 472,900 square-foot facility situated on 29 acres, it is the largest children’s museum in the world. Visitors can explore the physical and natural sciences, history, world cultures, the arts, see how dinosaurs lived 65 million years ago in Dinosphere: Now You’re in Their World®, experience Dale Chihuly’s Fireworks of Glass, and examine children’s impact in shaping history in The Power of Children: Making a Difference. Tuesday’s “Museum of the Day” is dedicated to kids. This museum is one of the country’s best examples of an environmentally friendly museum. Children’s Museum of Pittsburgh became one of the largest Silver LEED (Leadership in Energy and Environmental Design) certified museums in the country in 2006, on the heels of a major expansion which included the renovation of the adjacent former Buhl Planetarium. The project’s design and construction practices used sustainable principles such as water conservation, energy management, waste management, reusing resources emphasizing the use of recycled materials and improving indoor air quality. A significant percentage of the wood used was from sustainable forests, over 50% of all materials were locally manufactured and/or harvested, and the contractors recycled 50-75% of building materials. Reusable building systems such as doors, handrails, light fixtures, and marble panels were salvaged and made available for resale to the general public through a unique partnership with Construction Junction. Prior to opening its doors in a new location at Symphony Park and with a new name, the DISCOVERY Children’s Museum, Lied Discovery Children’s Museum was located in the historic Cultural Corridor in Downtown Las Vegas. The museum’s co-founders, Robin Greenspun and Mark Tratos, arranged a partnership between the Junior League of Las Vegas and the Allied Arts Council founding a private, nonprofit educational institution in 1984. A bond issue authorizing the building of the Las Vegas-Clark County Library and Discovery Museum in 1985 gave the museum a permanent home, which opened its doors to the public on September 9, 1990. Groups are welcome; there is no use of mobile technology in the museum (most children’s museums use a “hands-on” experience). The giant pirate ship is a huge hit for must kids! $12.00 for ages 1 to 99 Free: Members and children younger than one year old; adults 100+ years old; Children under 13 years of age must be accompanied by an adult; 18 years or older. Adults are welcome without a child, however we just ask they leave their license/ID with Admissions during their visit. FREE accessible parking.